Can you identify recipients automatically using Outlook or Gmail signatures? No this isn’t possible, via a single click. This is a limitation of Microsoft Outlook (and Gmail) signatures. They do not allow footers to be “dynamic” and therefore it’s not possible for email recipient information to be passed through to us. 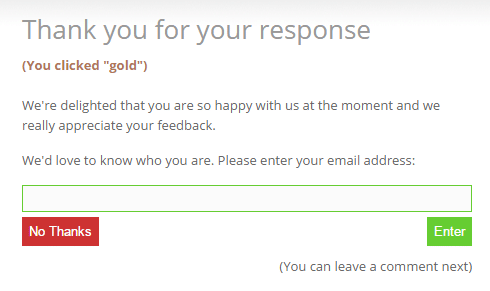 You are able to prompt respondents for their email address on your Landing pages. This feature is available in Outlook, Gmail, Basic Links and Basic HTML embedded Thermometers. Email addresses will be appended to the the response, if a respondent provides that information. If they don’t, you will still receive an anonymous response and any comment left. To enable, visit the Landing page tab with the Edit Thermometer screen. For many businesses, it is still valuable to have an overall view of satisfaction with responses being sent by different agents or staff members. If they choose “No Thanks”, the comment box will then be displayed (if enabled). If they enter their email address – it will replace “Anonymous” with that address. When capturing comments on Landing pages, edit the prompt to encourage respondents to leave their email address or phone number, particularly on the red and yellow pages. With on-premise MS Exchange and Office365, it is possible to use a tool called Code Two, which manages signatures for all, at a server level. Using Customer Thermometer with Code Two, it’s possible to identify recipients from the initial click, without prompting for email address. With on-premise MS Exchange and Office365, it is also possible to use a tool called Exclaimer, which manages signatures for all, at a server level. Used in conjunction with Exclaimer, it’s possible to identify recipients from the initial click, without prompting for email address. Find out more about our Exclaimer partnership. Can you identify senders automatically using Outlook or Gmail signatures? You will need to setup the sender when you create each signature Thermometer. When you generate your Thermometer, ensure you fill in the sender’s details as shown below. When you generate your hyperlinks, the sender’s details will be embedded within the tracking links and all responses associated with that Thermometer will be attributed to that sender. What is an Outlook / Gmail signature Thermometer?